At the conclusion of an eight-month competition, NYU’s most promising innovators received a combined $300,000 in start-up cash and valued services at the annual $300K Entrepreneurs Challenge, held by NYU Stern’s W. R. Berkley Innovation Labs. The five winning teams – composed of students, faculty and alumni from across the University – were chosen after pitching their ideas and enduring Q&A by judges from venture capital, technology and design, and social enterprise sectors. The $100,000 Rennert Prize, made possible by a gift from Stern Board of Overseers member Ira Leon Rennert (MBA ’56) was split between Knowu ($25,000) and Resprana ($75,000). 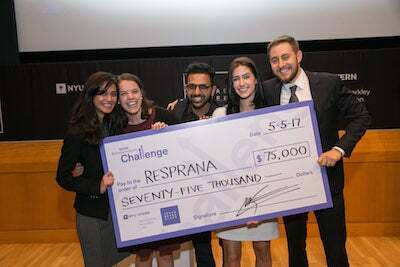 Founded by Stern undergraduate Sophie Frank, Tandon alumna Sukanya Goswami, Stern undergraduate Andrea McDonald, Tandon alumnus Jai Rathore and Stern MBA Micah Steiger, Resprana aims to prevent exposure from dangerous air pollution with a discreet in-nose air filter. 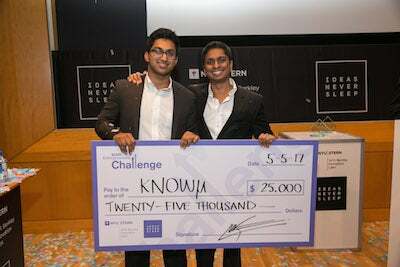 Founded by Stern alumnus Eugene Joseph (BS ‘11) and Dr. Arun Manoharan, former researcher with the NYU Center for Genomics and Systems Biology, Knowu optimizes the microbiome to improve the health of those with chronic conditions. 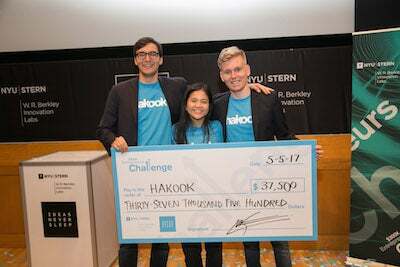 The $75,000 Social Venture Prize was split equally between Hakook and Share Meals. Founded by Stern alumnus Josh Dean (BS ‘16), Gallatin student Michelle Doan, CAS alumna Paula Ho, CAS student Raylen Margono, Stern alumnus Isaac Marshall (BS ‘16) and Stern alumnus Ian Reagan (BS ‘16), Hakook provides real-time assistance for the homeless by creating a network of volunteers willing and able to help someone in need. 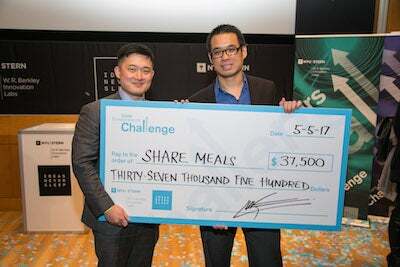 Founded by Steinhardt student Jon Chin and Stern alumnus David Kim (MBA ‘16), Share Meals reduces food insecurity by redistributing unused campus meal swipes and food surpluses from events. 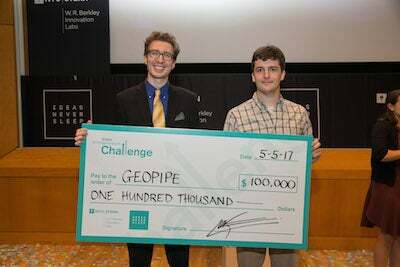 The $100,000 Technology Venture Prize was awarded to Geopipe. Founded by Thomas Dickerson and Courant alumnus and Professor Christopher Mitchell, Geopipe uses algorithms and machine learning to create highly detailed virtual models of the real world. 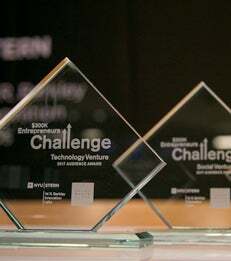 The Technology Venture Competition is sponsored by the NYU Innovation Venture Fund. "This year's finalists tapped into the incredible talent available across the University,” said Frank Rimalovski, executive director of the NYU Entrepreneurial Institute and managing director of the NYU Innovation Venture Fund. "A strong multidisciplinary team is essential to startup success. The Entrepreneurs Challenge is a great opportunity for entrepreneurs from across NYU to come together and receive the training, support and mentorship to transform their ideas and inventions into scalable businesses." “This year, we saw new ventures addressing a number of business, global and societal issues, from managing chronic health conditions, serving underbanked populations, sourcing newsworthy photos for media organizations, air purification, recycling and connecting working mothers with flexible employment opportunities,” said Cynthia Franklin, Director of Entrepreneurship at the W. R. Berkley Innovation Labs. Each finalist team delivered a short pitch followed by a short “Explainer Video” before an audience of NYU students, faculty and alumni, as well as members of the broader NYC startup community, who voted for their favorite teams. This year, Resprana, Bridge the Gap and MediVis received the Audience Choice Awards. In addition, faculty from Stern’s Management Communications Department selected three winners for this year’s Best Pitch Awards, recognizing Resprana, Hakook and Acculis for their exemplary presentations. In recognition of the critical role volunteers play in mentoring, coaching and judging the teams throughout the competition, Tobey Nelson received this year’s Volunteer-of-the-Year Award, presented by the Innovation Labs’ Cynthia Franklin. The winner of Stern’s Mobile App Contest, “Mission: Appossible,” was also announced: Run On. More than 131 applications were received in the second annual Contest, from which five finalists vied for a chance to have their app fully developed by Messapps, a New York-based design and development studio, or $10,000. The People’s Choice Awards in this year’s Mobile App Contest went to Cluster. New Venture Competition: William R. Berkley, Brian Cohen, Kathleen DeRose, Robert Fabricant, Spencer Lazar, Laurel Touby. Social Venture Competition: Marissa Feinberg, Alberto Gomez-Obregon, Conor Grennan, Jeffrey Hollender, Daniel Katz, Greg Van Kirk. Technology Venture Competition: Kim Armor, David Aronoff, Colin Beirne, John Elton, Alex Iskold.